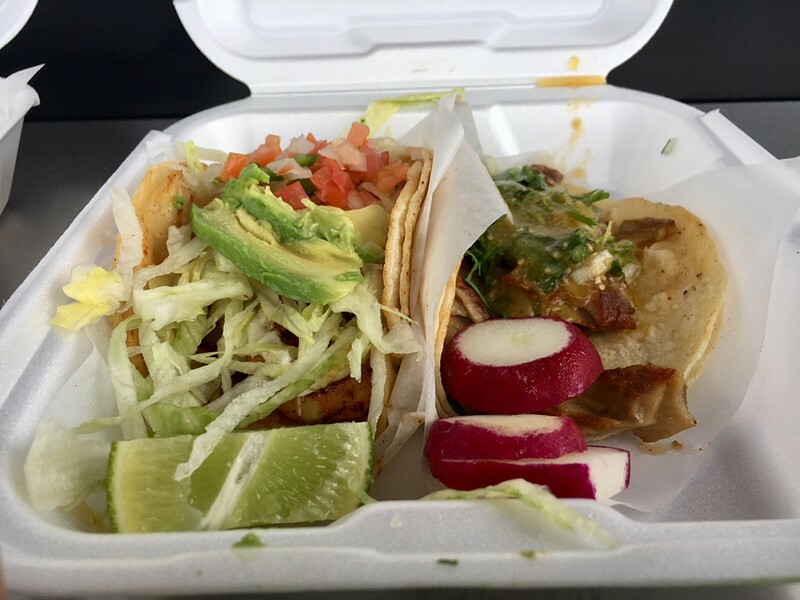 Left to right: The shrimp and buche tacos from Tacos El Gallo. You wouldn't think a slick, black truck edged with flames and emblazoned with a majestic rooster in profile would be hard to find. And yet, there I was, circling the Broadway Cinema parking lot, cursing the person who'd recommended the Tacos El Gallo truck (a film reviewer who shall remain nameless and who, it turns out, drove around hangry at the coworkers who'd recommended it to him the first time he tried the tacos). In fact, Tacos El Gallo (no relation to the similarly named Los Gallos Taqueria in the Bayshore Mall) had moved a few blocks down Broadway to the 76 gas station off 14th Street (1411 Broadway, Eureka), now arguably the best smelling gas station in Humboldt. Happy as you might be with your standard carnitas order, change it up and you'll be rewarded. If you're early enough, there may even be fresh habañero salsa. The shrimp taco ($3.75) with large, plump, spiced grilled shrimp, lettuce, pico de gallo, avocado slices and mayonnaise is lovely and fresh. The buche taco ($2.99), filled with charred, earthy curls of pig's stomach — more tender and meaty than beef tripe — is enlivened with the tang of a chartreuse salsa just hot enough to put a little color in your cheeks. Don't miss the foil packet of grilled green onions that comes with the tacos and is well worth requesting on its own. If you're not up for seafood or offal, truck co-owner and cook Alex Figueroa suggests the chicken with good reason. The standard chicken burrito ($7.25) is filled with char-grilled chunks of marinated thigh meat, pico de gallo, homemade rice and firm pinto beans that I promise are not a waste of space in either your belly or the tight column of foil. Take a moment to appreciate its shining perfection in a chaotic world.